Delicious Banana Walnut Bars with a caramel sauce that is layered in the dessert! These vegan snack bars are delicious for anyone, but those that avoid animal products will especially appreciate this tasty dessert! Guys, the art of entertaining has been slowly dying for me and I’m not too happy about that. I need to find a way back to enjoying the company of others in my home as well as finding stress-free meals that are acceptable for all types of menu plans. 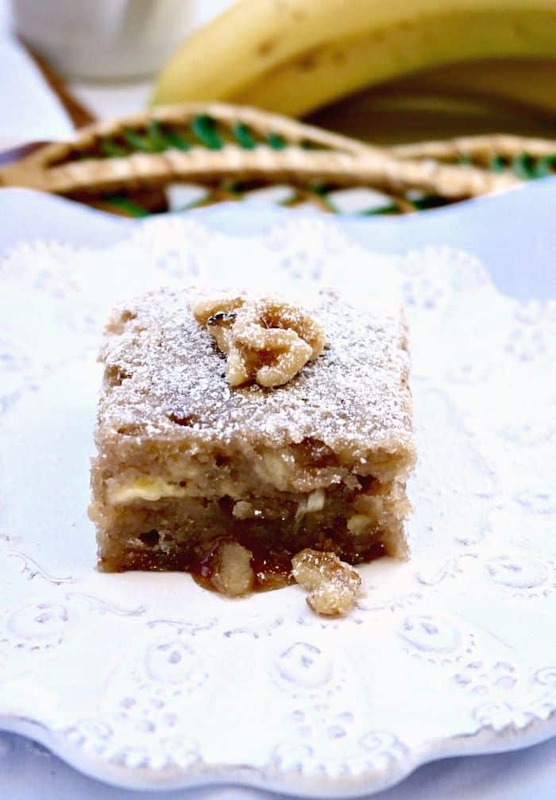 I’m starting my recipe selection with these easy and flavorful vegan Banana Walnut Bars that I found over at The Seaman Mom. When Alan was on active duty military status I used to entertain a good portion of the 28 years that he served. I really enjoyed getting my Navy family and friends together to share meals. Sometimes the gathering would be a potluck where everyone brought their favorite dish, and many times I would host the whole event and plan every detail; décor, menu, drinks, cooking, cleaning that was required for a hosted gathering. I never-ever (EVER!) worried that I might prepare something that would cause a reaction to a food allergy or that would be restricted in our guest’s diet. Back in the day – lol! I can use that phrase with confidence. Very few people had food related allergies or if there were friends that needed to stay away from different types of foods I wasn’t aware of the issue. Most of my circles of friends were meat and veggie eating, dairy sipping, as well as grain noshing folks. With the exception of my vegetarian circle, which was less than 5 of the friends I knew, we did not exclude entire food groups from our diets. Times sure are changing! I’m not saying one way is better than another (I’ve limited food groups temporarily too). My point is that in the past it was easier for me to serve a meal that would be enjoyed by everyone! I need some fabulous back-up recipes that do limit some food groups. This recipe is made without eggs or butter, so your vegan friends are covered with this sweet treat. I’m always a little skeptical when a bar-type of recipe doesn’t use eggs as a binder, but boy this recipe held together well! 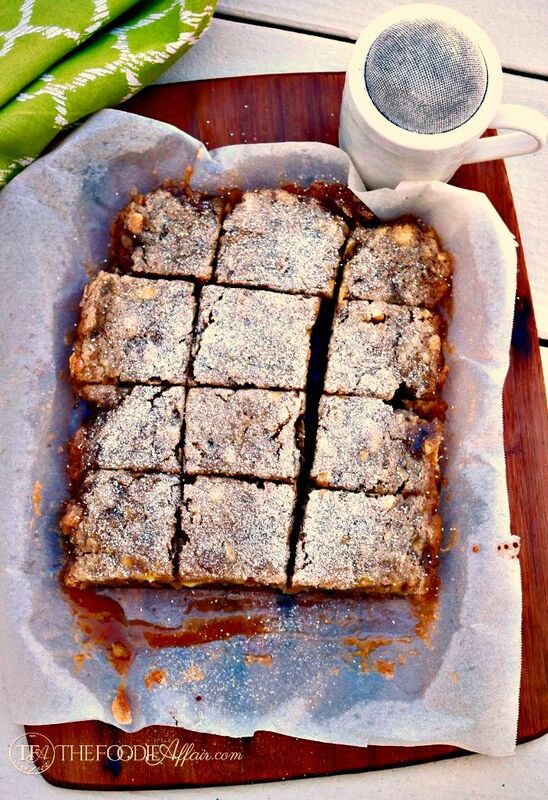 The added bonus is the caramel sauce that’s baked right into these bars. What a delicious addition! Gluten-free? I suppose I should have used a grain-free alternative! Whoops! SEE the dilemma when choosing recipes that are acceptable across the board? How do you adjust to cooking for those with dietary restrictions? 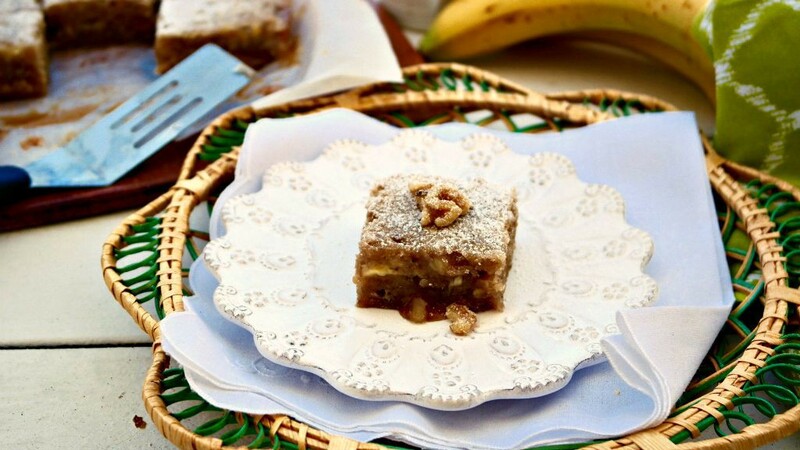 Find Petro’s recipe to print here: Vegan blondie with banana with walnuts and caramel sauce and go take a look at all the other recipes while you on the site! Lots of delicious foods over there! I made one minor adjustment to the original recipe by substituting the coconut sugar (I was out) for brown sugar. As soon as I saw this recipe, I stopped in my tracks and had to make it right away. This recipe is a keeper and will make again. These bars are delicious and will be enjoyed by all! Sandra, what a great honor to have my recipe featured on your site! Thank you so much! I must admit your bars hold together much better than mine and they look oh, so delicious! Thank you again, you just made my day! I totally agree with how hard it can be with so many different dietary restrictions! Your bars sound wonderful. All I had to read was caramel and you sucked me right in! Isn’t that caramel a nice surprise?! I seriously think I’ll be making that to eat with other treats! First of all, your pictures are melt in your mouth good!!! These bars look so tasty!!! I am trying to be good on a diet but I may have to try these out at my next dinner party! 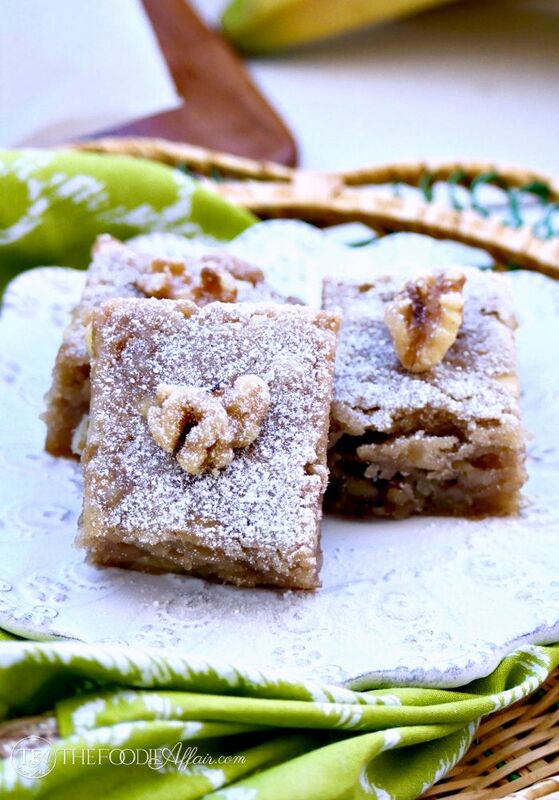 Leave out the walnuts (allergies) and these are perfect! They look nice and gooey! These sound amazing! I love banana! This is proof you don’t have to miss out on yummy treats with a vegan diet. These look and sound so scrumptious. I always ask what people can and cannot eat anymore. We don’t run into food allergies much, but there is always someone on a different diet or vegetarian, low carb etc. It can be hard. This recipe would be fantastic for some many. I want to try this. it looks delicious and an awesome food! I love that you added caramel in these bars! They sound and look like a perfect treat! 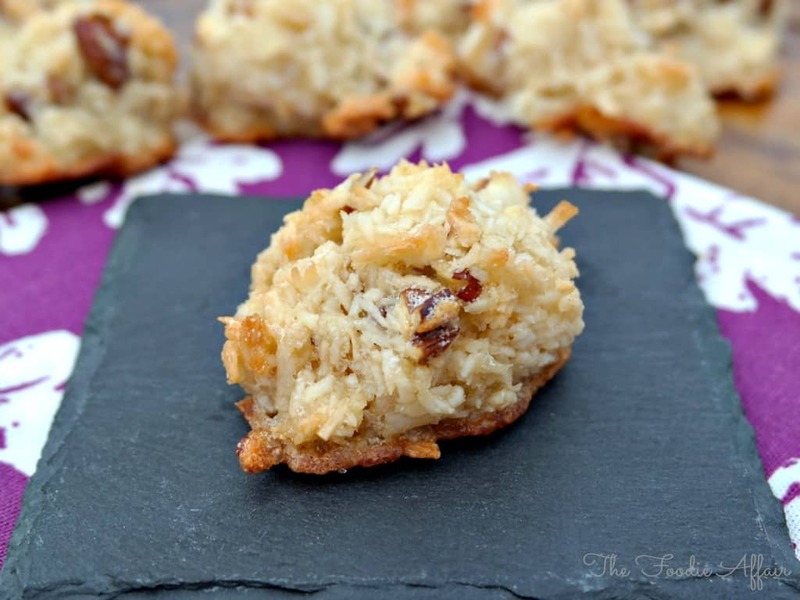 These sound so good, perfect for those with egg allergies! I absolutely love the banana/walnut combo, and these bars look amazing. I wouldn’t even think they were vegan! I really love the caramel sauce addition. I’m laughing my way through this delicious post because my daughter has a 6 food allergies, so I feel your pain of trying to make something to please everyone! Unfortunately one of her allergies is tree nuts so we won’t be able to make these together but they look wonderful and you did a great job of making sure they hold together w/out the egg! These look amazing. My mom is vegan, I will share this recipe with her! If you’re willing to host, I’m willing to come over for a gathering, particularly if you make these delicious treats. Wow! What a treat these are. Drooling! These look delicious. Bob’s Red Mill makes a great gluten free flour blend called 1 to 1 that would work really well in this recipe. I love seeing vegan bar recipes. This is exactly up my alley! 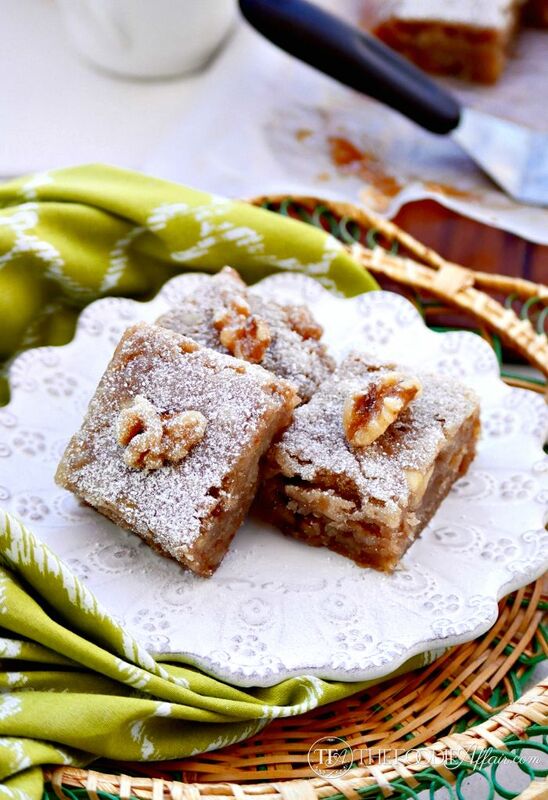 Walnuts are my favorite ingredients in bars.